In order to get started on this portion of the S.B.A, it is necessary to reflect on the three artifacts that were procured during the research process. The artifacts can be written, an audio and a visual. Simply put, you must have one written artifact, which can be an article, an excerpt from a book, a poem, a comic strip, and the list is endless. The artifact needs to contain written words. Please note that this artifact cannot be short and it must contain at least two paragraphs, in order to ensure that a proper language analysis can be made. The audio (song, commercial etc) as well as the visual (movie excerpt, music video, play excerpt etc) must also contain enough words to facilitate a proper reflection. Therefore, if the commercial has three words, it cannot be used. The syllabus stipulates that these artifacts must be analysed, or reflected on, in three different ways. The artifacts must be analysed in terms of how each artifact helped to shape the student’s thinking about the issue/ topic/ theme/ event. There should also be an analysis of how language works in the artifact, as well as how the process of doing the S.B.A helped the student to become a better person. The students must NOT say that it has not impacted them. How they felt about the topic before engaging with the data sources. The impact that was created after reading/ engaging with the sources. The student should seek to not only identify these elements, but to analyze the effect that it has on the artifact. Becoming more critical in conducting research. Developing confidence in knowledge of the issue/ topic. The process might have been laborious but they have become more knowledgeable. The word limit for all three reflections, combined, is 450 words. The artifacts should be analyzed, or reflected on, simultaneously, for the three different headings. It is, therefore, prudent that all the artifacts are collected (during the research period) before the students start writing their reflections. The three reflections should be presented in continuous prose, in one document. Therefore, you might have one to two paragraphs on reflection number one, then you proceed directly into the language analysis, in another two to three paragraphs. Your final paragraph would be the third reflection, which deals with how the research makes you a better person. 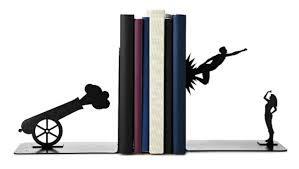 There should be no heading breaks, just one continuous flow of prose. Outline, step by step, how the three (3) sources were chosen. Summarize each source in relation to the particular topic that it addresses. List the group members and state their specific tasks, regarding the construction of the written report. Based on #4, do the selected sources address the group theme? How? Identify where each source was found. (newspaper/ internet/ poetry anthology). Is each source valid or not, based on where it was found? Create a Reference page in which artifact is cited using APA/ MLA/ Internet. Statement on the validity/ invalidity of each source. A very short summary of each source. A list of members of the group and their particular tasks. Drama: a short skit that involves the other group members, with the student having the primary and significant role. The other group members should play flat, supportive roles (role play)/ a commercial that warns about an action, or promotes an event. Poetry: the student can write their own poem, or dub, poem, or whatever format they choose, that highlights their topic. It must be their creative reinterpretation of their topic. Prose; the student can write an argumentative speech that presents their perspective on their topic/ an expository piece that explains something about their topic/ a descriptive piece that describes an aspect of their topic. 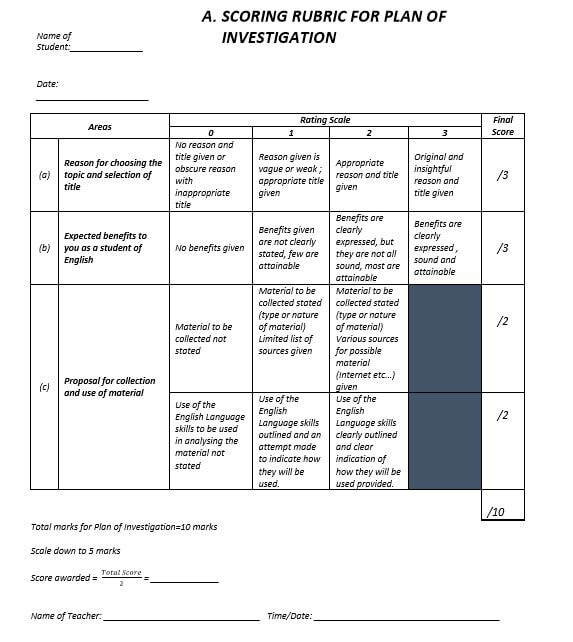 The next step in this process is for the student to identify the sources that they used, and provide a short summary of the language in each (formal or informal/ general tone/ standard or non standard/form of writing). This summary can be presented in note format ie bullet points. The students' presentation should be based on their topic, and should be delivered, primarily, in Standard English. Their can be use of a local Creole, for emphasis, but it cannot be the primary form of delivery. It is not required that these presentations are recorded. The presentation should be 4 minutes in length. Individual Participation - This is where the student is assessed, individually, in terms of how they interact within their groups. 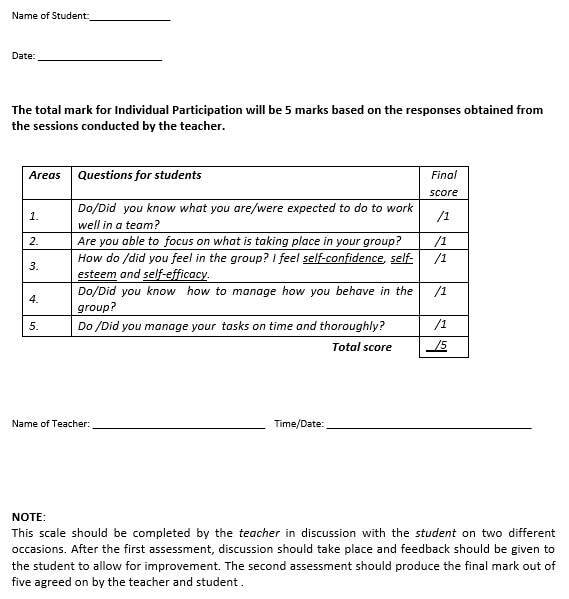 Below is a form that the teacher administers, and the student completes. On the first administration, the student fills out the form and the teacher discusses the results with the student. This is to give the student a chance to improve his/ her's score. The second, and final, assessment, is where the teacher assigns the score. Assessment times are at the teacher's discretion. 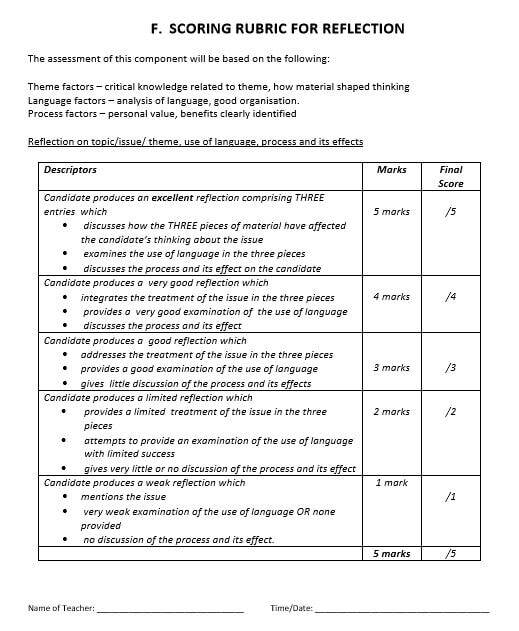 Reflection - This is where the student reflects upon, or analyzes, the three artifacts that is produced from their research, under three headings. The first heading is how the artifacts have impacted their views on the topic, the second is a language analysis and the third looks at how the research has made the student a better person. 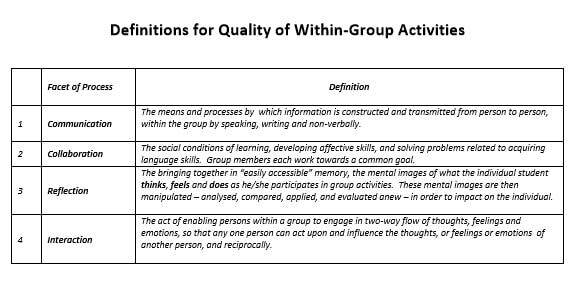 Group Activity - This form should be used to assess the quality of the group activities, within the S.B.A groups. It should, therefore, be used to assess the S.B.A groups during the written report. 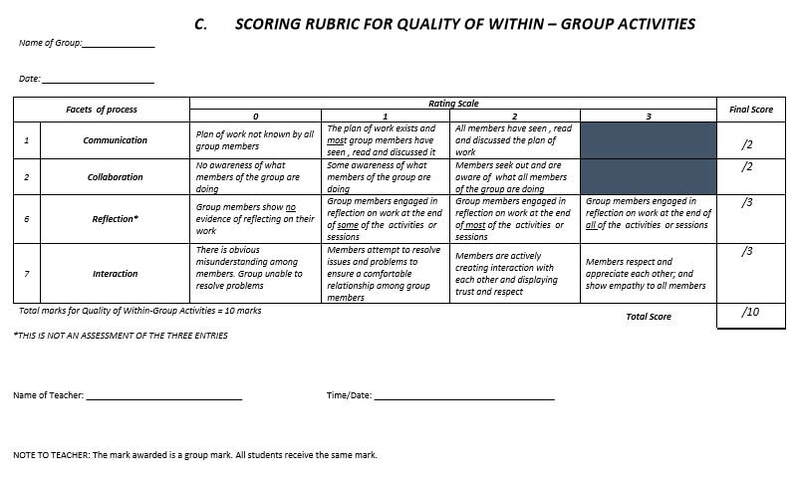 Written Report - This is the rubric for the group activity that should be conducted within class time, by the S.B.A groups. 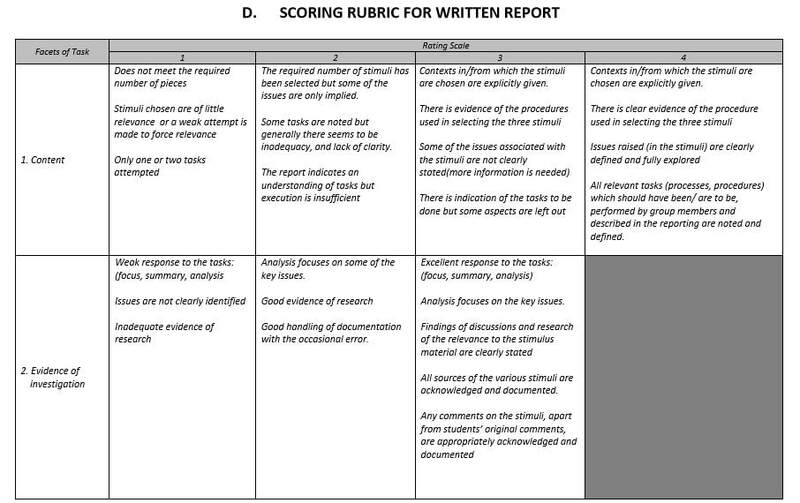 The teacher reads each report and assesses it, based on this form. Please see pages 60-62 of the CSEC Syllabus for further details on the facets of the task. 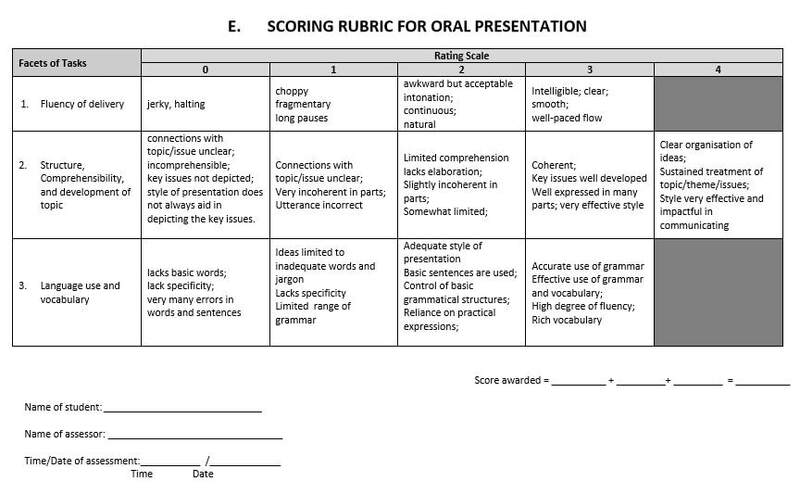 Oral Presentation - This is the rubric for the presentation/ speech that the student gives, after the written report.